Please enter email above to subscribe to this Blog. Thank You! 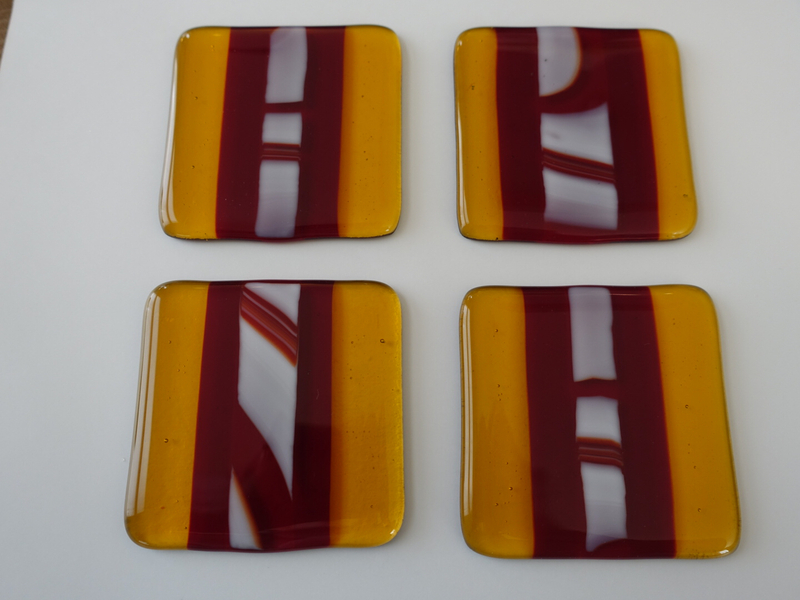 Using up the irid gold glass from the last project. These are slumping into sushi plate molds. 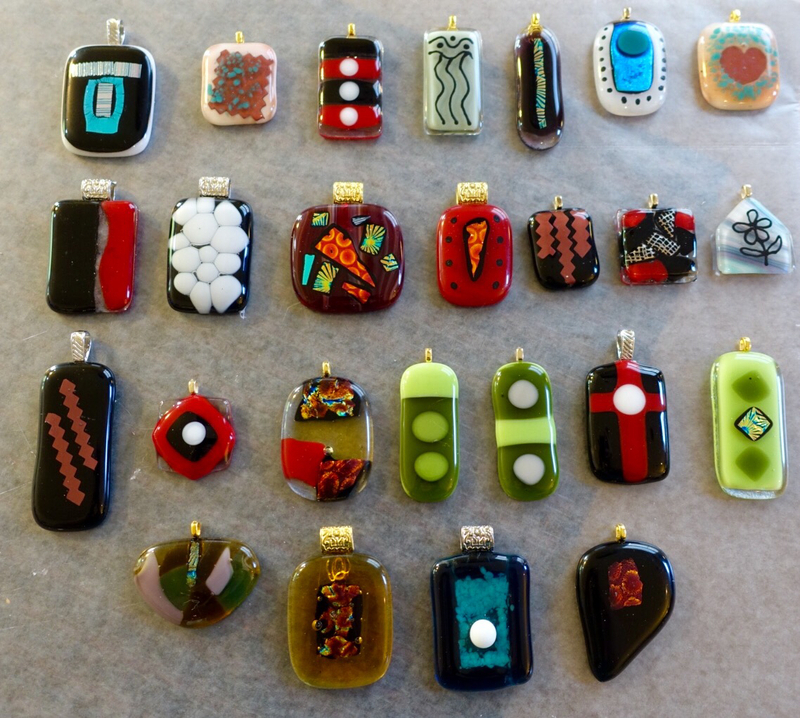 Also had room in the kiln for some Pendents. Check back for the slumped photos. Photo below shows sushi plates after firing. 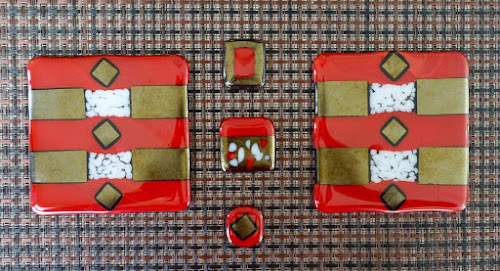 Finishing up the red glass with 2 more sushi plates 5x5. They have Glass Line Paint artwork that I drew on the iPad and then printed and traced on to the clear top layer of glass before firing in the kiln. This is really what I want to do more of. Free hand painting and drawing on glass. 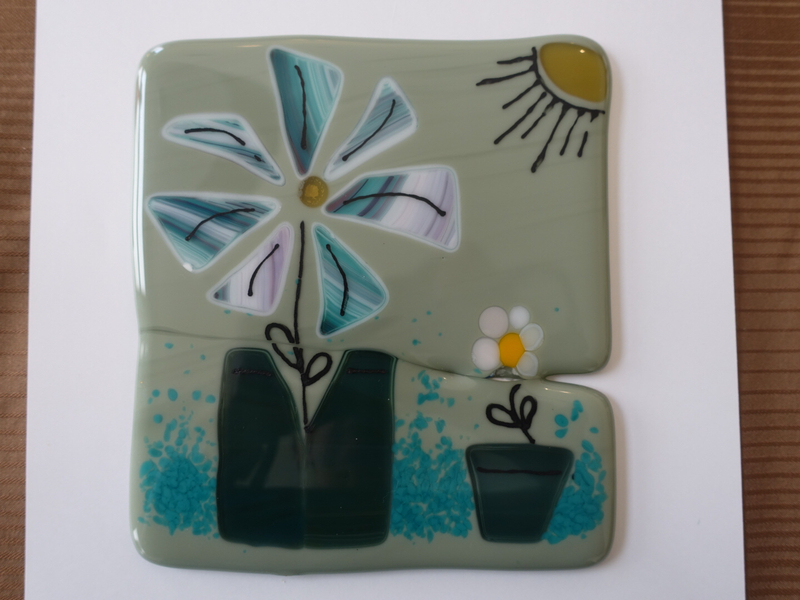 This piece out of the kiln this morning. I tried using Bulleye 90 Coe for the first time. 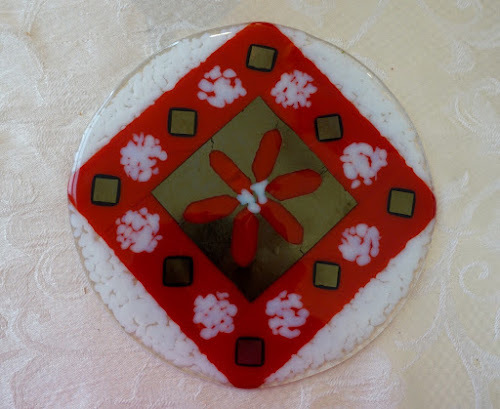 I used a pre cut clear circle with irid black gold and plain red with course opal cloud frit. The black around the small diamonds is from the black base of the gold irid. It flows where as the irid coating does not spread. The black makes a nice outline. 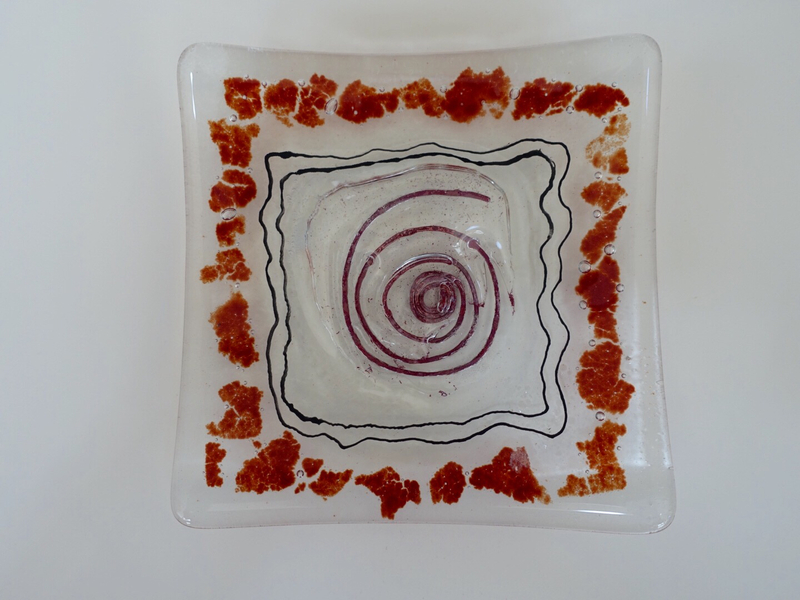 I fired it at the slow firing schedule provided by Bobbie Glo Kiln manual. It seemed to work good. This will remain a panel unless I get a shallow bowl mold. It looks nice in a plate stand. 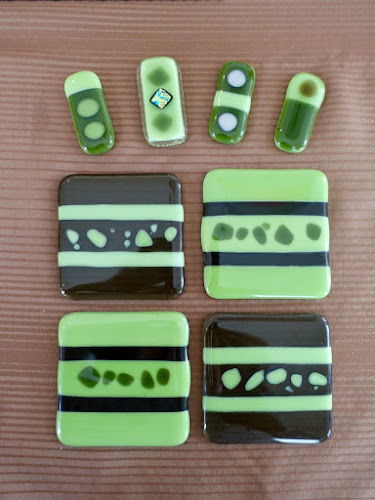 Yesterday I made these cabochons. Pretty happy with them but I had to cold work 3 of them as they flowed somewhat unevenly. 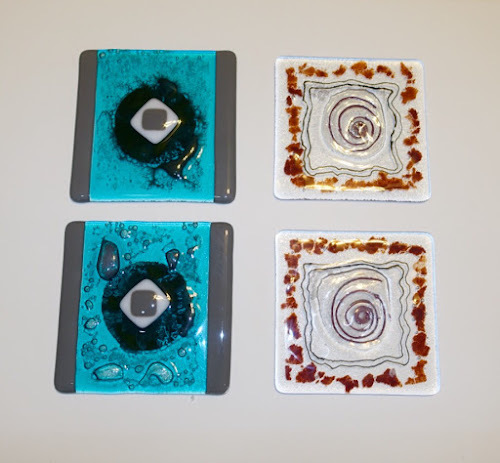 One because I used white glass that is softer and flows more and the other two because I had one area that was 3 layers which spread more also. 1. Don't use aluminum foil for an inclusion unless this is the look you are going for. It cannot withstand the heat and it flows and breaks up. It also turns brown or dark depending on top color of glass. 2. Bubbles using baking soda worked well but some of the aluminum flowed into the larger bubbles making them darker. I did not put baking soda over the aluminum foil area. Just in the blue area. 1. The Flexiglass brownish border worked fine. The color was supposed to be black cherry but turned out more brown. 2. The black line paint on top layer worked fine. Could have used the thicker tip to apply. 3. I put the baking soda solution in the area surrounding the copper wire but not in the area of the Flexiglass. The wire spiral created air caps even though I flattened the wire with a hammer. A large bubble surrounds the spiral now that it's been fired. The surface of both the blue and clear tiles are not flat the large bubbles are raised somewhat. 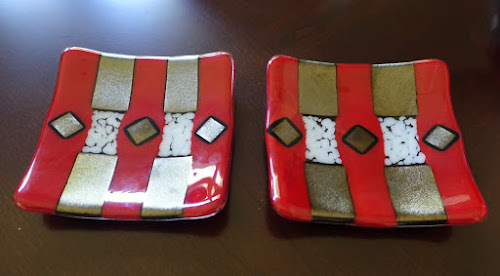 I used 1/2 tsp baking soda in 1/4 cup water on both colors of tiles. I think I should have followed directions I read about that used 1 tsp soda per cup of water. Maybe bubbles would have been smaller. 4. The copper wire dulls and turns more brownish. I new that would happen. From these experiments I discovered I probable won't use aluminum foil again and that I will probably experiment more with baking soda. I will also experiment more with the Flexiglass-glass. You can cut it nicely with a sharp exactly blade but you have to be gentle with the Flexiglass-glass. You can cut curves easily. I like the copper wire inclusions and might work more with that. I am wondering if you can put the wire on top of the top glass layer? Will it sink into the glass or not? Let me know if you have tried that. I think I will still try and slump these just to see if the large bubbles will flatten out any. I will let you know what happens. Ok the photos below are after slumping. They slumped just fine but the large bubbles did not flatten out. 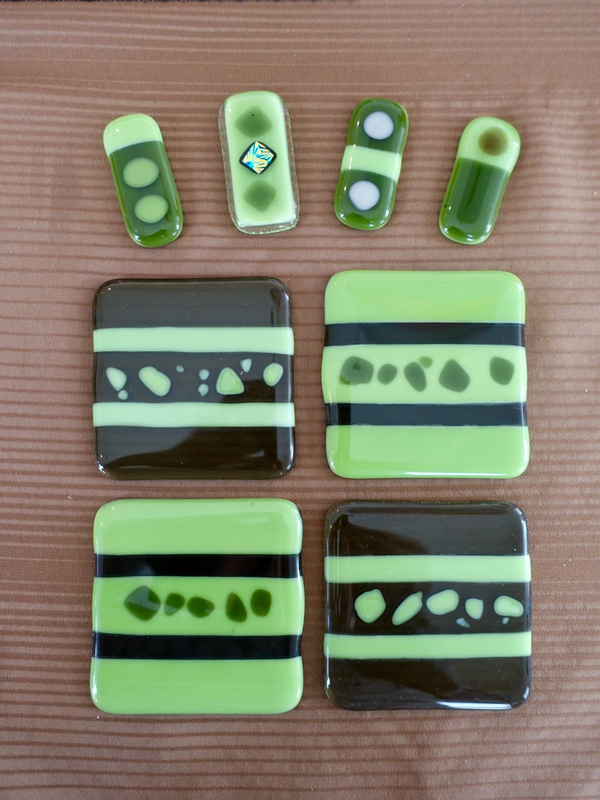 This was my first slumping with my new BobbieGlo Kiln. I used the pre programmed schedule and it seemed to work great. This photo I used a fill flash and it shows the texture and bubbles more. This photo has no flash and shows less detail. 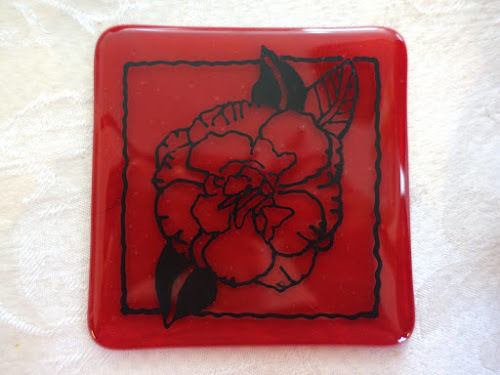 This is a small pendant I put in with the first firing. It has the Flexiglass curve and pieces of copper tape that I removed the adhesive from. 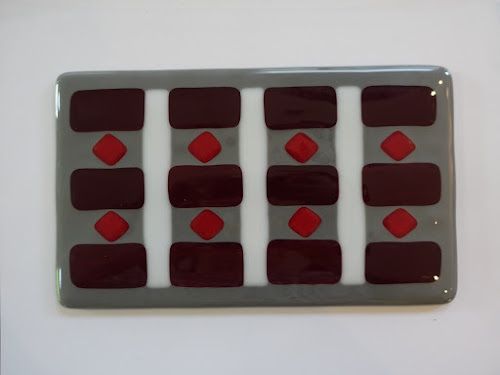 The glass has a little texture on the back because I placed it directly on the kiln floor that had sifted kiln powder on it. 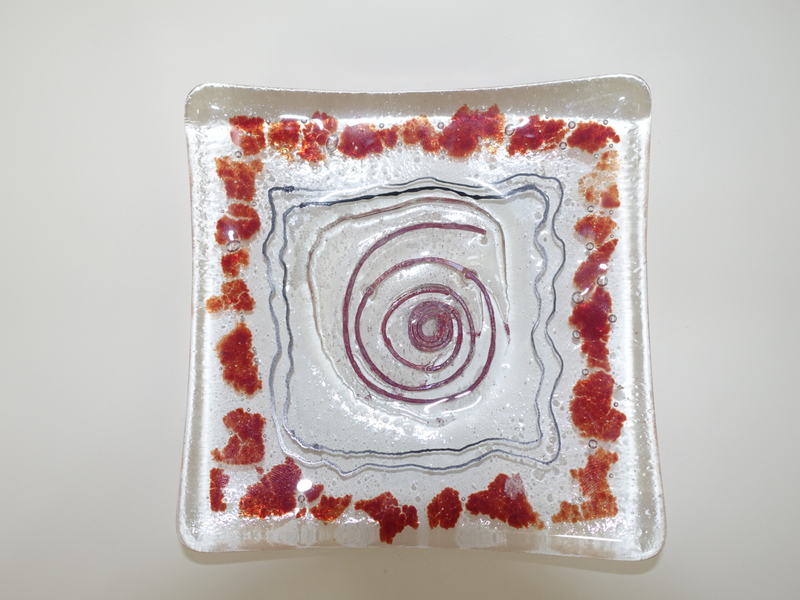 If you want to create texture to the back of your glass the kiln powder is a good way to do that. I am firing the 2 blue plates now. We will see how they turn out later. These is the blue ones after slumping. No change in the bubbles or aluminum foil. The photo below shows the projects I have in the kiln now. They involve some techniques I have wanted to try. 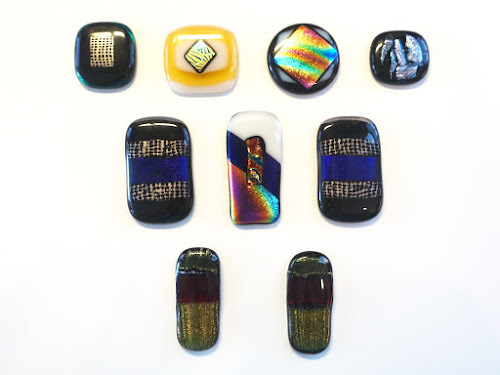 One technique is using flexglass. It is made with a store bought gel called flexi-glass, a sheet of silicon plastic and some glass frit powder. 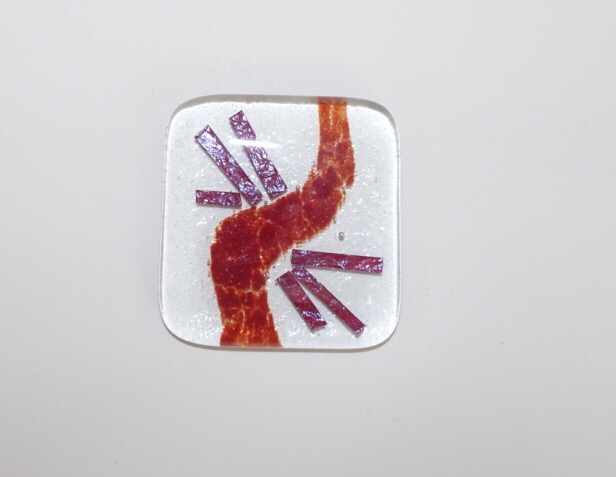 You make sheets of thin glass and you are able to tear, cut or stamp shapes out of it to use in your glass projects. 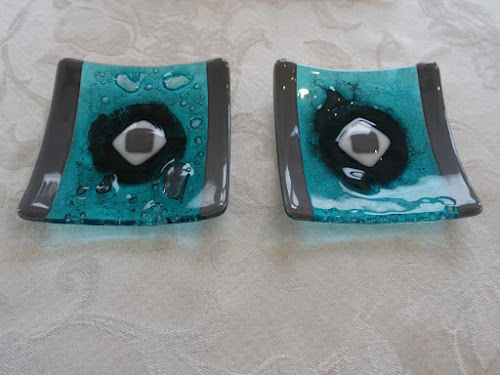 The second technique is making bubbles in your glass by coating with baking soda and water solution in between the layers of glass. 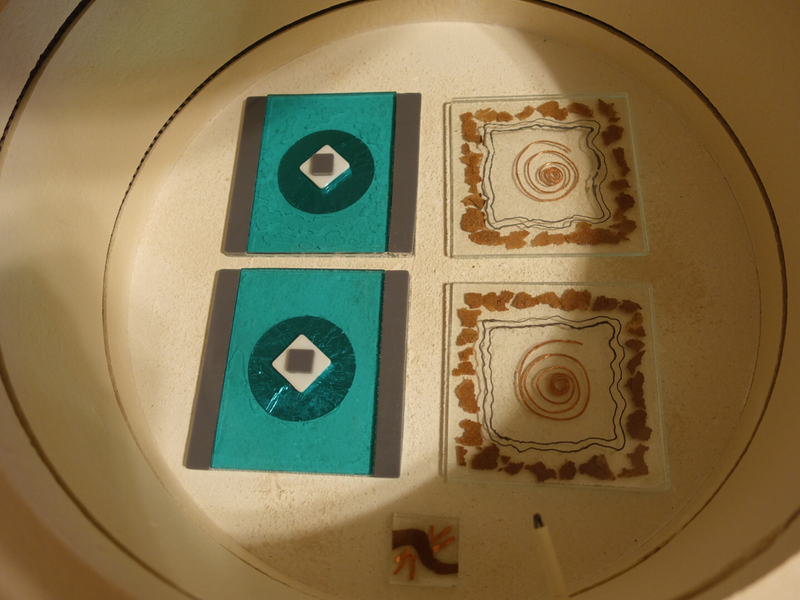 The third technique is placing copper wire in between glass layers as an inclusion. On the left side I used aluminum foil as an inclusion. I also used glass paint lines on the top layer of glass, but I have done this before. 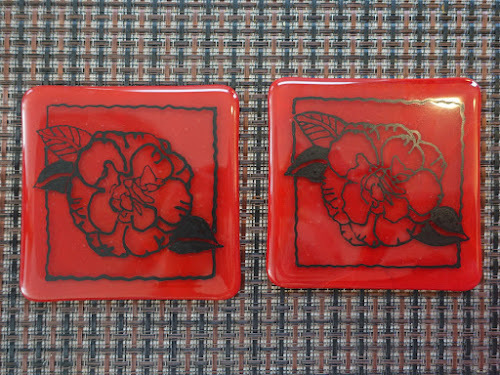 I bought some 5" sushi plate molds so if these fuse ok I'll be slumping these into them. This photo is before firing. Hopefully I'll be able to show you a good photo of how all these techniques worked out. 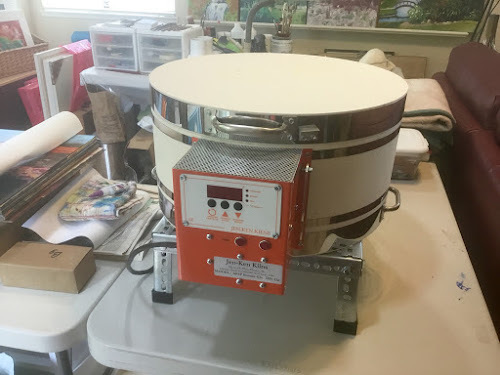 I got home from Phoenix and decided to buy a small kiln. 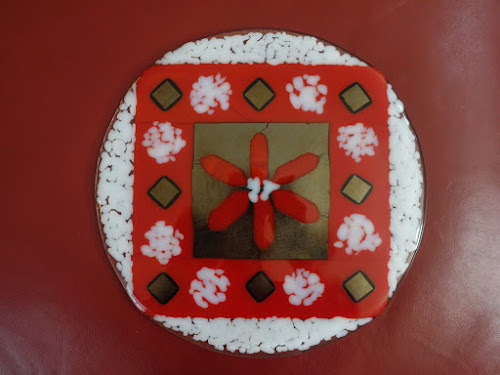 It is 15" across inside. It is big enough to fire a lot of jewelry and yet big enough to fire large plates and bowls. It is great to use in my home studio. It doesn't heat the room up too much either. I have fired 3 or 4 times with it and it works great. I'm so excited to have it. It was a nice birthday present. I've been trying out some of the pre programmed schedules and some schedules I put in. 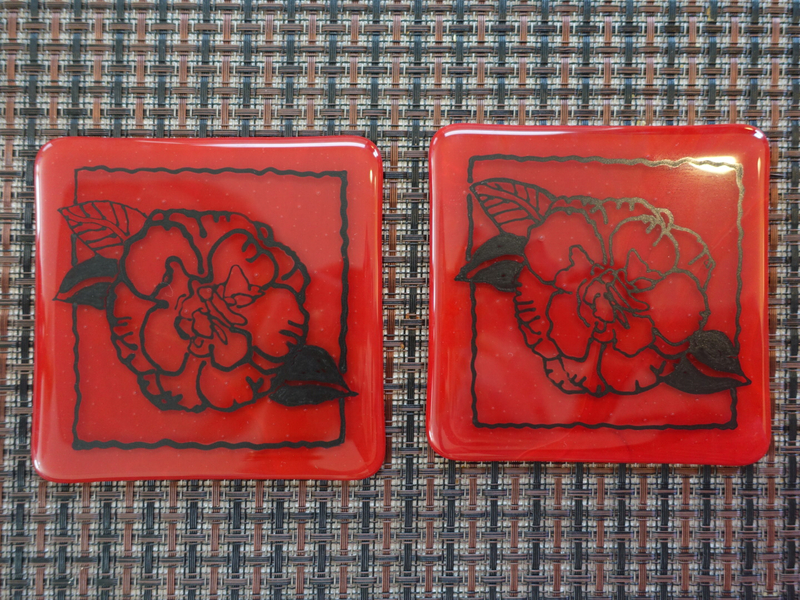 For these tests I've been making jewelry and coasters. They have come out well. The tile above was the only failure. I tried to fire this with jewelry at too fast a rate. The jewelry was fine but this 5x5 piece was too large for that firing schedule. It's just a learning process. This piece will be slumped into a sushi plate as soon as I buy the mold. Not bad for just using up glass scraps.